As I reviewed Andrew’s end of year progress report, I noticed that he still needed some reinforcement with graphing. I looked through my stuff to see what I could have him graph. There were all sorts of things – stickers, buttons, a variety of Goldfish crackers, fruity Cheerios, pattern cards, etc. 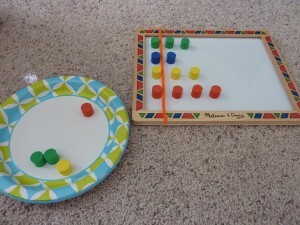 (Here is a past post I did on graphing using a small bag of M&M’s.) I decided to choose these colorful foam pieces that I found in the dollar section of Target. 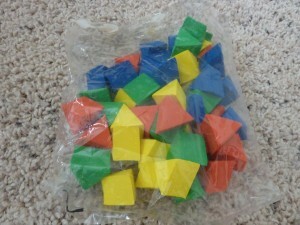 They came in cylinders, cubes and triangular prisms. 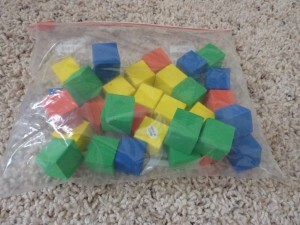 Funny Story – I was teaching a parent session a few months after I had picked these up. 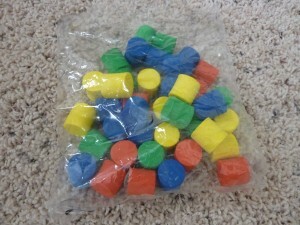 I pulled them out of my basket of stuff and one of the moms yelled out, “I have those! I knew you would get them and show us some ways to put them to use so I got them as well.” Ah, I’m beginning to rub off on people and I love it!! While I usually use a sheet of white printer paper to make graphs with him, this time I decided to use my Melissa and Doug pattern piece background and a pipe cleaner bent around the sides as my border. 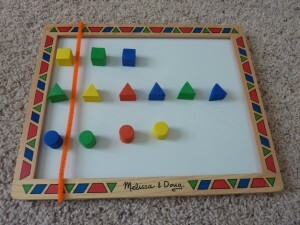 I am demonstrating here two different graphs using these foam pieces. One is graphing cylinders by color and the other is sorting by shape. 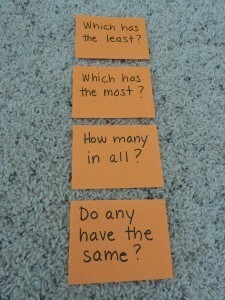 I also like to include question cards to help build math vocabulary while analyzing the data. 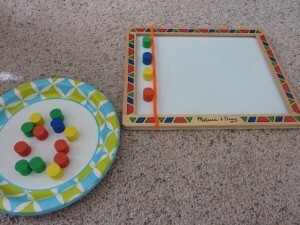 You could also begin this activity with making a prediction or hypothesis about which color or shape your child thinks will have the greatest/least/same amounts. Anytime I can sneak in vocabulary in the context of play I do! Click here for a great resource listing math vocabulary in alphabetical order with illustrations to help build understanding – A Maths Dictionary for Kids 2011. Some question cards to go along with the graph. Graphing by color station all set up and ready to go! In the process of making the graph. Graph completed. Now for some question cards! Graphing by shape station set up and ready to go! 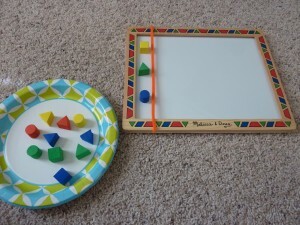 I encourage you to get creative by looking around in toy bins and pantry cupboards to see what easy items you have to help your child build graphing skills. 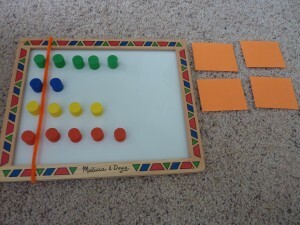 These are just examples of basic graphs that can be easily put together as a station activity.